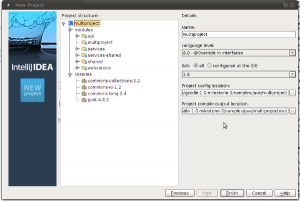 Keen to try Gradle integration in IntelliJ IDEA? You asked us to add Gradle support to IntelliJ IDEA. And when you ask hard we usually respond. So, we’ve been working hard on that lately. The job is still in progress but the most impatient ones can already try what is done. The plugin will be available when IntelliJ IDEA 11 EAP opens but if you really can’t wait, check this wiki page for instructions on how to build IntelliJ IDEA and Gradle plugin from the sources. It also shows current development status. Your feedback is much appreciated on the discussion forum or in IntelliJ IDEA issue tracker. This entry was posted in New Features and tagged Gradle, Nika. Bookmark the permalink. 24 Responses to Keen to try Gradle integration in IntelliJ IDEA? I don’t understand why Jetbrains is working on features like this that few people will use instead of working on IntelliJ performance problems. That is great news, thanks! Will the gradle integration provide advanced editing support for gradle build scripts (like autocompletion)? 2. Believe us, not the entire JetBrains works on this particular feature. Performance is being taken care of too, constantly. That’s good to hear. Voting doesn’t work very well for performance issues because usage models vary greatly from user to user. For example, I use Remote Desktop Connection heavily which is much slower under IDEA 10 than 9, so while all my coworkers who don’t work remotely have upgraded to 10, I’m still using 9. Can’t resolve target gradle project at….. I tried with the nightly gradle builds from Sept 8th and Sept 13th. Any ideas? I’ve never build IDEA CE before and have never used Gradle, so it might be a simple oversight on my part. ..so the instructions relating to the tooling API on the wiki page may be incomplete. I have the same problem as Ryan. I’ve tried with different versions of Gradle, and I’ve verified the gradle-tooling-api jar is in lib. No matter what, the project won’t build. I asked gradle guys to have a look on that. The tooling API jar should contain idea-specific classes like IdeaProject, OfflineIdeaProject etc. I could not wait for this plugin, what’s the release plan? Tooling api jar does contain idea-specific classes. The problem is that OfflineIdeaProject has been renamed to BasicIdeaProject a couple of weeks ago. I could have communicated it more explicitly, sorry The thing is we only guarantee the tooling API does not change between releases. Milestone-5 should be out soon and I think it would be good if the gradle idea plugin actually shipped with the tooling api jar (currently it is a ‘provided’ dependency). It does not seem to be related to the tooling api because this class comes from the IDEA’s openapi module and it does not have any dependencies to the tooling api. Just to add another voice, I also have the “Gradle version contains incomplete tooling API”. I’m using gradle-1.0-milestone-3, and have been using “apply plugin: ‘idea'” to generate my IDEA .iml files. It’s weird that milestone-3 came out in, what, April?, and there has been no further update since. Wonder what’s up with that. 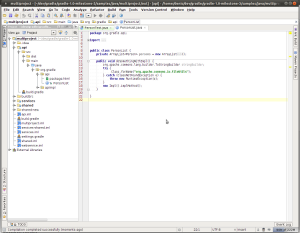 Just adapted the changes at the gradle and intellij idea api to the gradle plugin. 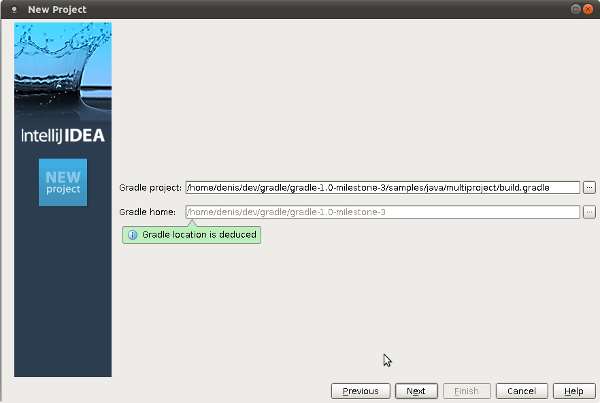 ‘Import project’ works for me now (tested against gradle v. 1.0-milestone-5-20110926003039+0200). Feel free to rebuild intellij idea from sources or wait for the next EAP to try the plugin. Gradle DSL Syntax highlighting is nice. Completion is better. But what about Quick Doc Lookup (Ctrl-Q). The Gradle DSL doc is actually very good, and it would be excellent it it was possible to access it with Quick Doc lookup instead of through a browser. I haven’t been able to find any info about it, though. Is it even considered as feature at this point? Excellent idea, thanks! Will put it to the list. I couldn’t get the Gradle GUI to work, so I assume that part hasn’t been implemented yet. My project ended up configured to use a 1.7 JDK when I selected a 1.6 JDK during import. I imported my old IDE settings on first run, so maybe that had something to do with it. I had to update the compiler resource pattern to include some extra file types before the built in compiler would work. I still use the built in compiler for running tests as I’m working. Since gradle handles resource patterns by module, I don’t think it’s practical to try to resolve them during the import. I think ‘gradle idea’ sets it up to exclude .groovy and .java files and includes everything else. As a use case I have a UI module in my project that uses ‘src/main/java/**/resources/**’ in addition to the normal convention. One thing I always find myself doing when I import Maven projects is adding run configurations for the UI module(s). It would be very cool if the Gradle import could detect modules using the application plugin and automatically add a related run configuration for each. Something even cooler would be an option to import all tasks from *.favorite-tasks as run configuration during the import. Another wishlist feature would be an option to exclude all IDEA files from version control during the project import. When I import a Maven project the first thing that happens after import is that I get asked if I want to include the generated IDEA files into SVN – one dialog per module. I always select ‘don’t ask again’ and then immediately go into setting to ignore the file type (*.iml IIRC) and re-enable the prompt I just disabled. That’s all I can think of for now. Keep up the good work! For someone who is new to gradle, auto-completion and quick doc look up are the highest priorities for me. @Ryan: thanks for the feedback! I’ll check JDK processing on import and yes, no gradle tool window is provided within the plugin yet. I just installed the latest Intellij 11 beta and tried to use the gradle plugin to create a new project based on the latest Gradle (1.0m6) multiproject example (as your screenshots also show). The structure of the project shows up on the third step of the wizard correctly, but when I click Finish, I get this exception. I just installed the Idea11RC and it works great! Thanks for fixing the exception I reported in the beta. – I was kind of hoping that I would see a “Gradle build” button on the right that I could configure based on a build.gradle file the way I can configure “Ant build” based on build.xml ant file, and have all the tasks show up. I was able to run or debug tasks by right clicking on them, or add gradle tasks as configurations at the top, so that is very nice. – You get a 404 error when you click on help from Tools | Task | Open… | Configure | Help button. – I don’t see the svn 1.7 experimental plugin listed anymore, and can’t find how to get it. (even if I configured ‘test’ as my script parameter). It seems that Gradle is not receiving that script param…. What am I doing wrong? Please register such problems directly at the tracker instead of mentioning them at blog comments.